Entertain and teach your children during their bath time with the cute tugboat toys! One set includes 12 pieces of boat toys. They are durable and able to withhold kids rough plays. It's a great entertainment for daily bath time and a fun bonding moment between mom, dad, and children. Your child can exercise and develop sensory skills even during bath time! BATH TOYS: Contains 12 count of floating boat toys, 2 of each cool designs. LIGHTWEIGHT AND FLOAT: Made of plastic and easy for baby to grab and play with. Take the fun to the beach or swimming pool, not limited to your tub at home. The toys are suitable for both inside and outside. FUN CREATIVE LEARNING: Kids can learn to count and identify colors, make bath time more fun and entertaining! Your baby boys and girls can use their imaginations and act as they are ship captains, sailors, or crewmen. It is educational and can practice kids' fine motor skills and hand-eye coordination. COOL GIFT: Makes a great birthday, baby shower, and holiday gift. They are safe, engaging, and interactive, who wouldn't want to play with them! Put them on the side of your bathtub or bring them out to swimming pool parties or sand beach for great experience. 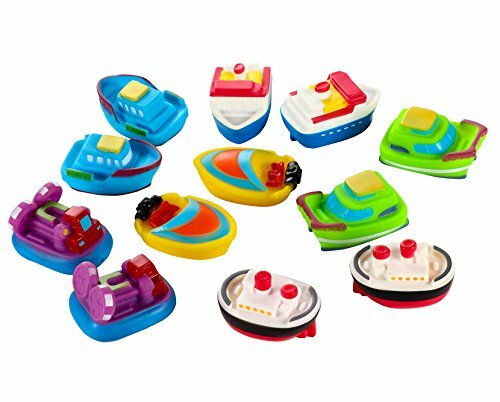 DIMENSION: Each boat toy measures approximately 3 x 1.5 x 2 inches, ideal size for children and adults.